Department store chooses Sheffield's recently refurbished Crucible Theatre for AGM. Pre-event planning: Each year a senior member of staff at John Lewis Sheffield is tasked with organising the annual general meeting and the responsibility fell to fashion floor department manager Sarah Stone this year. The event is an opportunity for the store's 400 partners to review results and learn about future strategies and projects. Having assessed a number of Sheffield venues, Stone decided to host the event at Sheffield's Crucible Theatre, which recently re-opened after a £15.3m development. Challenges: The AGM had to take place outside of the store's opening hours to allow the 400 partners to attend, meaning Stone needed a venue that could host a drinks reception and meeting after 6pm. Sheffield Theatres is the largest producing theatre outside of London and groups looking to use the main auditoria must work around a busy theatre season. Richard Beeby, events manager at The Crucible Theatre, says: "Our productions run through the year with the exception of the summer. Usually the main auditoria can only be used up to 4.30pm." Solution: In May, the Crucible was hosting a production called True West. Mondays are usually 'off days' so the main auditorium, which can seat up to 980 people, was available for use all day. As the production was being put on in-house, the events team negotiated for the group to use the stage and existing set - a kitchen and garden - which was an ideal fit with John Lewis. 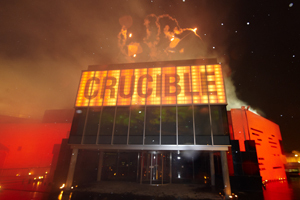 Post-event analysis: Stone says: "The Crucible is a refurbished venue in the heart of Sheffield, and the hope was that its 'wow' factor would add to the overall experience. The staff were all extremely helpful and keen for our event to succeed. We would recommend the venue and hope to use it again in future."